We didn’t go to as many splash pads this year because the pool is just so close and easy. So, by the end of August, we went to a few to make up for it. 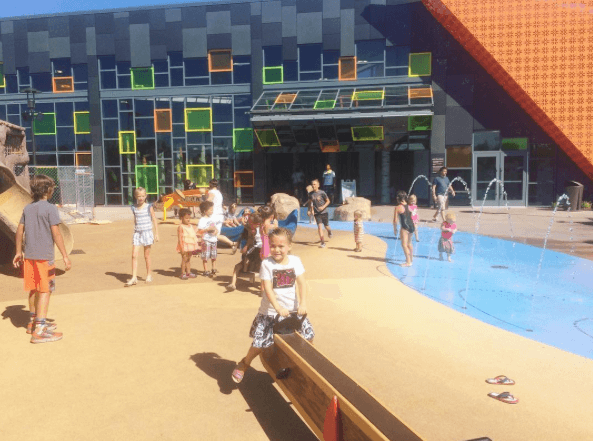 We are really lucky to have so many neat splash-pads closely! My brother and his wife were up in Utah in August, so we joined them one evening in Nephi at the demolition derby. We got a babysitter for Finn that night, which was so nice! I know he would have loved seeing the cars and trucks, but it was so much easier to sit in the stands for that long of an event without a toddler. This was our second year going, and we’ve decided it will be an annual tradition because it’s such a blast! Thanks, Sam and Ashley for taking us! This kid loves taking baths and one night he was being extra cute in the tub. It has been such a long time since I’ve blogged! I’m so behind! And going through all my pictures on my phone just makes me so sad that Summer is over. Don’t get me wrong, I’m excited for Fall but I just can’t believe how quickly it all went. Well, picking up where we left off… The first week of August, my sister-in-law and her husband went on a trip and we got to watch my cute niece and nephew for a few days. Each day we tried to do something fun! On Sunday night, we roasted marshmallows for s’mores in the backyard with them and our neighbors. Monday, we went to the pool. On Tuesday, we headed to the movies for $5 Tuesday and saw Despicable Me 3. Wednesday, we brought out the hose and played in the sprinkler all afternoon. We also hit up a splash-pad with some friends, and although it was busy, the kids had a great time! One sweet thing I want to remember while they were visiting is that on the first evening, I was reading them books before bed then asked who wanted to say the night prayer. They all volunteered and all begged me to choose each one of them, so that night and each one following, they all took turns saying their own nighttime prayers together. It was so sweet! Thanks for visiting, C&H! Okay this first one is actually end of June, but he is just so cute with his buzz haircut, I had to include it. I went to see Wonder Woman with these wonder women! 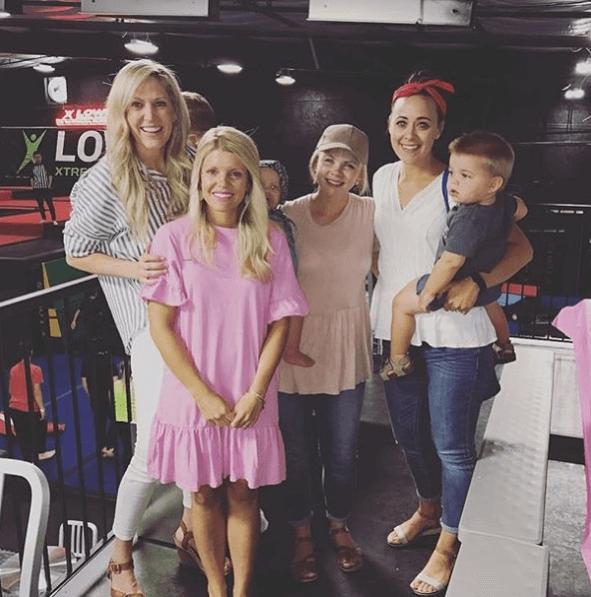 Such a fun GNO! Two of my friends from Jersey were in town so we got to meet up at a birthday party! Fun days at the mall! You can’t really tell from this picture but Eva got that shirt at the mall from her grandparents and the sequins can change direction to spell out “hi” or “bye.” She is obsessed… and maybe so am I! I cannot believe July is over. It was nonstop fun though. End of June we went to Bear Lake for five days. Two days later was 4th of July. Two days later we went to Kentucky for ten days. Five days later we went to St. George for three days. That day, my parents came to town for five days. So, yes. Kind of a crazy, but awesome July! Here’s to August! I’m ready to spend our days at the pool and splash pads and do some serious back to school shopping for my KINDERGARTENER!!! My dad had a convention he needed to attend for work here in SLC last week which meant we were spoiled and had my parents in town for a few days. On Tuesday, we went up to Temple Square and City Creek. It had rained in the morning which cooled down the afternoon making it perfect weather to explore. The flowers were beautiful and we really loved walking through parts of the visitor’s center we hadn’t been to in a while. Wednesday was the Outdoor Retailer show that my dad and I attended all day long while my mom watched the kids. It was really fun spending the day with my dad. I was thinking while working with him how grateful I am to get to do stuff like this with my dad. He’s a pretty good boss 😉 ! Then our last day, we went up to Tibble Fork for a little hike and then picnic there at the reservoir. The water was pretty cold though, so when the kids were done splashing, we kept heading up the canyon to Silver Lake. I feel like we could have spent the rest of the day up there because the views were incredible and it was just so serene. We played in the creeks, Finn threw rocks forever, and we took in the beautiful scenery all around us. 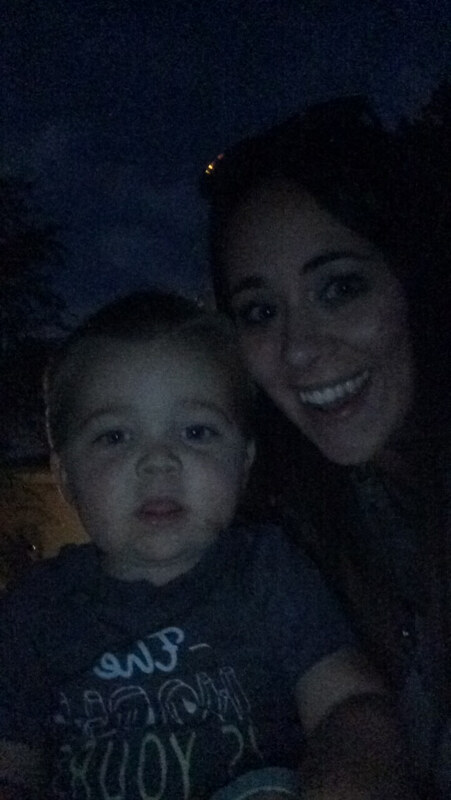 When we got home, we went to the pool after Finn’s nap and wrapped up the day with s’mores in the backyard. It was such a dreamy day! My parents left early on Friday. I cried on and off for the rest of the day because it was so hard to say goodbye! Till we meet again! TJ’s mom is from a town called Enterprise which is near St. George and they always have a cute parade and activities for Pioneer Day. So, we decided to head down there last weekend for the rodeo and the parade, as well as to visit with TJ’s extended family. The trip was so relaxing and a perfect little getaway. One funny thing I don’t want to forget was at the rodeo. Eva made friends with the little girl sitting next to us. She had caught a chicken at the rodeo during one of the events and she brought it back to her seat (which completely freaked me out). As Eva was talking to the little girl and getting to know her a bit, the girl asked Eva if she went down to try and catch a chicken too. Eva replied, “No… we don’t really want a chicken clucking around our house.” Oh my gosh. It was the funniest/cutest thing I had ever heard. I love that girl. She also kept asking if the little calves were okay or if the cowboys had killed them. She was very worried for them! TJ’s old college roommate had us over one Friday in July and the kids all were thrilled to get to stay up late and have s’mores. They have this amazing backyard and so they all were entertained for hours exploring together and playing. When we got home, it was 11 pm (live up summer, right?) and I would have thrown them right into bed but the kids were FILTHY. Seriously. So. Much. Dirt. I’m laughing just thinking about it. If that’s any indication of how much fun we had, then we sure had a blast! Last week, we met up with our dear friends and went on a little hike. It was pretty hike, but I loved seeing the beautiful view of the valley around us!